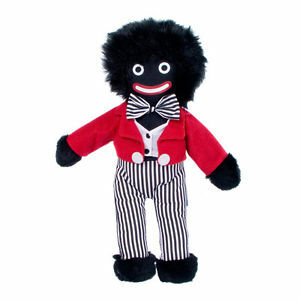 Is the Golliwog Doll a Symbol of Racism or Just an Innocent Child’s Toy? While watching an episode of Prisoner: Cell Block H, that was the question I asked myself and to others. A potential resident of the Susie Driscoll House (half house on the show) was looking at some dolls and she picked up this one. It’s called a Golliwog doll. I personally find it quite offensive, but others don’t. The golliwog, golliwogg or golly is a black fictional character created by Florence Kate Upton that appears in children’s books in the late 19th century usually depicted as a type of rag doll. It was reproduced, both by commercial and hobby toy-makers as a children’s toy called the “golliwog”, and had great popularity in Europe and Australia into the 1970s. The doll is characterized by black skin, eyes rimmed in white, clown lips and frizzy hair. Though home-made golliwogs were sometimes female, the golliwog was generally male. For this reason, in the period following World War II, the golliwog was seen, along with the teddy bear, as a suitable soft toy for a young boy. The image of the doll has become the subject of controversy. While some see the golliwog as a cherished cultural artifact and childhood tradition, others argue that the golliwog is a destructive instance of racism against people of African descent, along with pickaninnies, minstrels, mammy figures, and other caricatures, and it has been described as “the least known of the major anti-Black caricatures in the United States“. In recent years, changing political attitudes with regard to race have reduced the popularity and sales of golliwogs as toys. Manufacturers who have used golliwogs as a motif have either withdrawn them as an icon, or changed the name. In particular, the association of the golliwog with the pejorative term “wog” has resulted in use of alternative names such as “golly” and “golly doll”. (Source: Wikipedia). The doll, to me, reminds me of the days of minstrel shows back in the day. White people would dress up in black face and look like the doll presented here. Being shocked by such a doll I presented the picture in a Prisoner group am apart of on Facebook. I received a lot of feedback. I wish I had kept that post up so I could post reactions by some of the members. Some were in defense of the doll. Florence Kate Upton was born in 1873 in Flushing, New York, the daughter of English parents who had emigrated to the United States three years previously. Following the death of her father, she moved back to England with her mother and sisters when she was fourteen. There she spent several years drawing and developing her artistic skills. To afford tuition to art school, she illustrated a children’s book entitled The Adventures of Two Dutch Dollsand a Golliwogg. The 1895 book included a character named the Golliwogg, who was first described as “a horrid sight, the blackest gnome“, but who quickly turned out to be a friendly character, and is later attributed with a “kind face.” A product of the blackface minstrel tradition, the Golliwogg had jet black skin; bright red lips; and wild woolly hair. He wore red trousers, a shirt with a stiff collar, red bow-tie, and a blue jacket with tails — all traditional minstrel attire. I am the last person on this planet to be offended. To pull the race card or call someone a racist because they make off-color remark or joke about a race. We have too much of that going on right now. Some justified, some just for the sake being. I try to examine things before coming to any type of conclusion and I tried to do that with this particular doll. YOU DON’T FIND IT OFFENSIVE? Why didn’t the people in the Prisoner group find the doll offensive? Prisoner was a UK based show. The golliwog was popular and was not seen as racist. I think if I grew up with the doll as many Prisoner watchers did as well as others, I would not see it in the light as I do now. And I do not hold Prisoner as a racist show for having the doll. I love the show and am a huge fan of it for many reasons, in which I should write in a blog at a later date. But for now, I hope to get responses to the golliwog doll, good or bad, for we can all learn from each other’s background. Anonymous: It’s so sad that children’s cuddly toys were made offensive. Just because some adults decided to use the word in a horrible racist way doesn’t make the toys offensive. My friend was selling some vintage golliwogs on ebay and was told to remove them.